Big Keypad for easy dialing, Big Font for easy viewing and Big Volume for easy hearing. IP68 Shockproof, dustproof, robust, completely protected against dust and moisture, a reliable partner in the open air; falling and shatterproof, falls from normal height thanks to the strong structure, very good damping, impact is reduced. 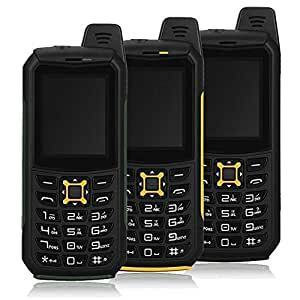 Multi-Uses: Best gift for the elderly, young students, and other people who like to adventure & hike, it’s also perfect for military use or as a replacement phone. Great as an outdoor smartphone, more solid and stronger, and suitble for you who love outdoor life and the heavy industry workers – relax when you are on the beach, playing game, climbing, skiing. We will test one by one before we send out the product, make sure all products are in good condition.